Junagarh Fort is a fort in the city of Bikaner, Rajasthan, India. The fort was originally called Chintamani Mahal and was renamed Junagarh or "Old Fort" in the early 20th century. The Junagarh Fort also known as Bikaner Fort is an unconquerable fortress which has withstood the ravages of time and has remained unconquered. It is among most famous forts in Rajasthan. It is a must visit place in Bikaner. There is also a museum in Junagarh Fort which displays various artifacts anf collections of ancient Bikaner. Junagarh Fort is an impressive fort of Northern India famous for its magnificent architecture, design, and decoration. This imposing fortress was built in1593 A.D by Raja Rai Singh, Army General of the Mughal Emperor Akbar. He was also the sixth ruler of the city of Bikaner, who ruled it from 1571 to 1612 AD. This fort is attacked several times but never been conquered. Only Kamaran Mirza, who was the son of Babur was able to capture the fort but couldn’t even retain his hold for more than one day. The structures built within the Junagarh fort are the palaces and temples, which are made of red sandstone and marble. The palaces are described as picturesque with their assortment of courtyards, balconies, kiosks and windows displaying the original lifestyle and way of living of the Maharanas of Rajasthan. The massive fort built in the plains of Bikaner has a rectangular layout with a peripheral length of 1,078 yards. The fort has seven gates for several palaces, pavilions and many temples of Hindu and Jain religions – the earliest dated to the 16th century. The beauty of the fort lies in the stone carving done in red and gold colored sandstones. The interiors of the palaces are decorated and painted in traditional Rajasthani style. The Junagarh Palace have a large number of rooms, as every king built his own separate set of rooms. The design and architecture of these rooms and the entire palace are dominated by Gujarati, Mughal and Rajputana architecture and design. Chandra Mahal has the most luxurious room in the palace, which houses gold plated divinities and paintings inlaid with costly stones as it was the bedroom of the Maharaja. In the Badal Mahal you can see the paintings of Shekhawati Dundlod rulers paying respects to the Maharaja of Bikaner in different types of turbans. Photos of people standing on nails, wood, swords and saws are also depicted showing an example of faith. This fort is a magnificent fort known for its design, decorations and constructions. Some of the other known attractions of this fort are Ganga Mahal, Badal Mahal, Zenana quarters, Har Mandir and more. ‘Prachin’ is the store having collection of vintage textile and costumes with some shops. This collectible house has 9 am to 5 pm timings and entry fee of Rs 10 for Indians and Rs 25 for foreigners. 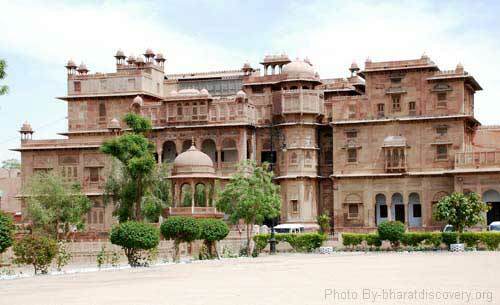 By Road: Junagarh Fort is located in Bikaner city near Sursagar on Junagarh Fort Rd. One can easily reach here by RSRTC bus, local bus or local taxi or walk. By Rail: Junagarh Fort is well connected through nearest Bikaner Railway station (2km) to major cities railway stations like Delhi, Agra, Mumbai, Chennai, Bikaner, Pali, Jaipur, Ahmedabad. By Air: Junagarh Fort can be reach through nearest Jodhpur Airport (250 Km) which is well connected with regular domestic flights to Delhi, Mumbai. I like historical places specially forts. and they way you describe about this fort very good specially how to reach and timing.